As a remedy to the increasing cold and dark of a Scottish December, Project Reveal Team East went on a hunt to find the festive side of Newhailes. It’s that time of year when the days are short, the nights are frosty and the Christmas lights start twinkling. One of the first things we noticed when we started working at Newhailes was a catalogue record entitled ‘Christmas Decorations, box of’. When Newhailes became part of the National Trust for Scotland, all the contents of the house came as well. This included items used by the family in the celebration of Christmas. This week we decided it was the perfect time to go and search out the hidden Christmas spirit of Newhailes. 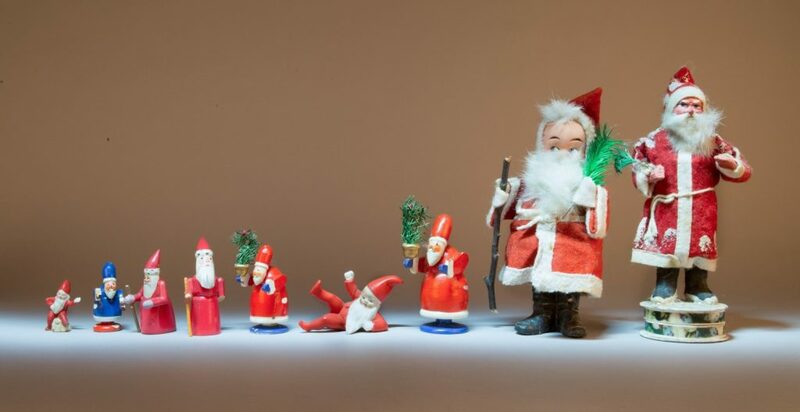 Carefully packed in a plain brown box and hidden in a desk drawer we discovered a delightful collection of Father Christmas figurines, all dressed in his distinctive red coat and sporting a snow-white beard. 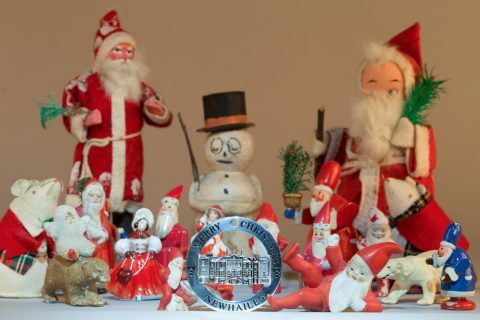 The figurines are clearly from different time periods and manufacturers, yet they all fit the uniform image of Santa. But where did our modern idea of Father Christmas originate? The earliest Christian stories of St Nicholas describe his good deeds and miracles, including one in which he resurrected three murdered boys had been put in a pickle barrel by a wicked shopkeeper. An early 16th-century triptych in the collections of the National Galleries of Scotland depicts some of these legends, including the pickle barrel miracle. 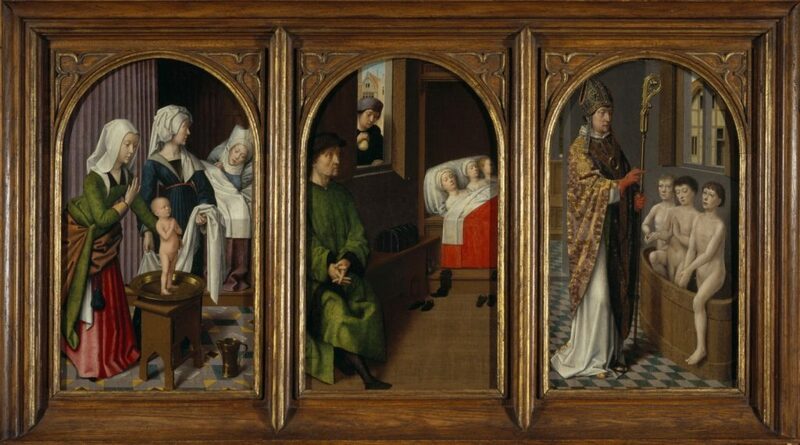 In it, St Nicholas is shown as a bishop in dress contemporary to the time. It was not until the 19th century that Santa had a more consistent appearance; before this he wore anything from a blue hat to yellow stockings. 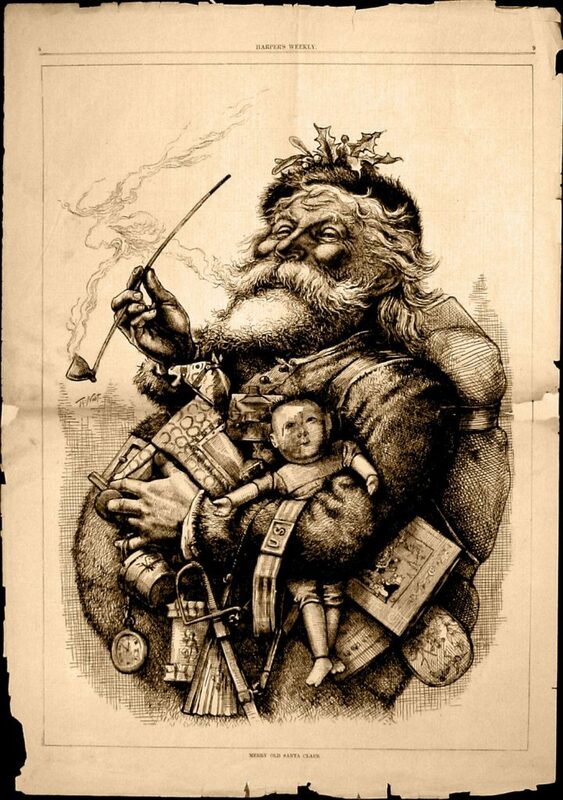 Although his image was already being used in commercial advertisements and Christmas decorations, a cartoon published in Harper’s Weekly in 1881 is the earliest visual reference for our modern notion of Santa Claus: a jolly, portly man with a white beard, wearing a red coat. This cartoon by Thomas Nast was based on a poem by Clement Clarke Moore titled ‘A Visit from St Nicholas’ (now more commonly known as ‘The Night Before Christmas’). Coca Cola later appropriated the image in the 1930s for an advertising campaign that has further cemented our modern image of Santa Claus. As if this jolly selection of Christmas figurines wasn’t enough, we received a tip-off from Anne, a volunteer at the house, of another collection of Christmas items in one of the upstairs rooms. 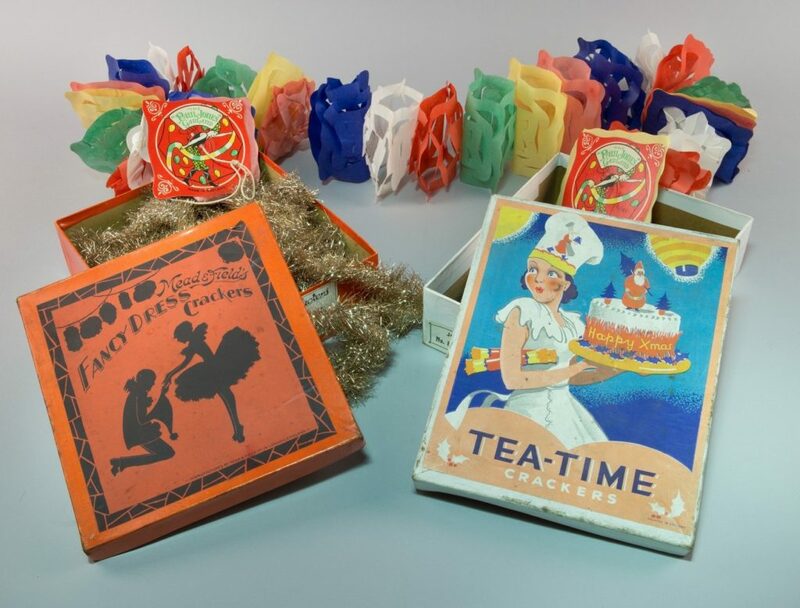 This time we came across two old Christmas cracker boxes labelled ‘Caley’s Tea-Time Crackers’ and ‘Mead & Field’s Fancy Dress Crackers’. The creation of the first Christmas cracker is attributed to confectioner’s apprentice Tom Smith in the 1840s, who was inspired by the way Parisians wrapped up bon-bons in tissue paper and twisted the ends. Over the decades, crackers have come in many different themes and with a variety of contents. The boxes found at Newhailes proclaimed to be ‘filled with musical toys’ and ‘an attractive assortment of carnival hats and caps with jokes and conundrums’. Sadly, there were no crackers left inside but, like so many old seasonal-themed boxes, they had been used to store gold tinsel and multi-coloured paper streamers. So, as you put up your decorations this year, think about what your collection of Christmas items says about you and your family’s history. This article is by Michelle Atherton, Alexandra Hill, and Kevin MacLean of Project Reveal Team East . Project Reveal is a multi-site digitization project of unprecedented scale. With your support, we can help the Trust manage its collections more effectively. Most important, we can help the Trust discover, better understand, and share its treasures with the world. This article was originally published by the National Trust for Scotland on December 14, 2017.